The following article first appeared on 12/17/15 in Transportation Matters, an IowaDOT publication. Click Here to see how Fleetwatcher's Material Delivery Solution can be used to Optimize Cycle Times, Reduce Trucking Costs, and Improve Paving Operations. It seems that most everything is going electronic these days, and for good reason. Going paperless can improve business operations and decrease the amount of resources needed to get the job done. In the highway construction industry, electronic lettings have been standard operating procedure for the Iowa Department of Transportation for years. More recently, the e-Construction process removed time-consuming paper shuffling right up to the point where the asphalt truck arrives at a job site to unload. 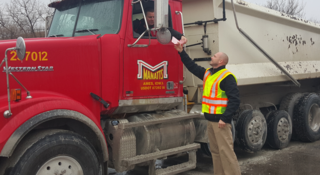 Working with Manatts Inc.’s Ames office, Mulder and his staff recently piloted a “proof of concept” project and developed what they think could be the next step in a paperless, efficient process for documenting asphalt deliveries to highway construction projects. For the initial pilot project, the Manatts’ crew began working with Earthwave Technologies, of Indianapolis, to electronically track Manatts’ trucks using a global positioning system (GPS) in what Earthwave calls the Fleetwatcher system. 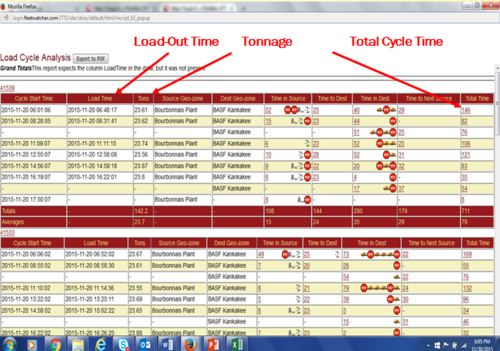 This system not only tracks the location of trucks through GPS, but displays important details regarding load cycle times at the plant, on the job, and travel times between. GPS transponders were easily installed in both company-owned and third-party trucks Manatts was using to haul hot-mix asphalt (HMA) to the job site. Additionally, GPS transponders were installed on the two pavers being used at the job. These GPS transponders sent data back at several points in the process where Geozones (which are pins placed on a digital map that allow sending automatic notifications when the transponder enters the specified area on the map) had been established. -  A static GeoZone was set up around the HMA plant site. -  A tighter sub-Geozone was established around the scale to zero in on load-out times. -  A static Geozone was set up around the project’s perimeter. -  A mobile (or moving) Geozone of approximately 20-foot radius at the paver. The software recorded the truck’s location during the entire cycle with time-stamped data when entering the scale, leaving the plant, entering the project, backing up to the paver, and finally leaving the project and returning to the plant. Along with this, the Fleetwatcher system updates and records an electronic trail every minute throughout the day with real-time dashboards and graphical reports to help the Iowa DOT verify that the certified product was delivered and incorporated into the project. These reports and dashboards also benefit the contractors in many ways, which have side benefits to the Iowa DOT. The process worked very well as a proof of concept for tracking and verifying the product life cycle from the certified plant to installation. To be completely successful with a paperless ticketing system, scale integration is needed with the Fleetwatcher system the Iowa DOT tested. Scale integration would allow for electronic verification of the product and tonnage to be included with the product location verification tool that Fleetwatcher already included. In the 2016 construction season, the Iowa DOT will conduct additional pilot projects that combine the electronic location data and reports from the initial pilot project with a new data element, electronic ticketing. 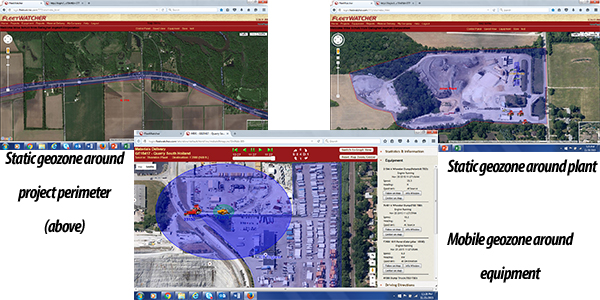 The software vendor is already working on and has successfully tested integration of electronic scales report-out systems with the GPS tracking reports to give contractors a daily summary report of the tonnage and certified material types along with the GPS tracking as a part of their materials delivery solution. About Earthwave Technologies: Earthwave Technologies is a provider of telematics solutions exclusively for the heavy equipment contractor. Our wireless fleet management system, Fleetwatcher, is used to help construction contractors get a better look at their fleet and help them reduce idle time, cut fuel and equipment costs, see cycle time and count, and track fleet location and activity. To help with these areas Fleetwatcher provides reports for our customers to easily read the data and develop a plan to address any problems these reports may highlight.